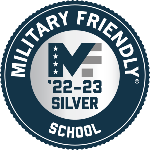 Military students are eligible to receive a 30% tuition reduction. We accept up to 60 credits from accredited institutions into our online degree programs. Our courses are designed to fit within your busy schedule and can be accessed from anywhere in the world. Berklee Online is honored to serve service members, veterans, and their families. With our online graduate and undergraduate degree programs, multi-course certificates, and individual courses, you can work toward your educational and professional goals in a supportive online community.